Who needs an open house? Not 5 West in Central Harlem, which is sold out, Halstead Property Development Marketing announced today. 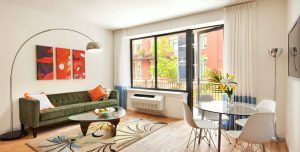 The six-story, 13-unit building at 5 West 127th Street between Fifth and Lenox Avenues offers a mix of one- and two-bedroom homes. Prices ranged from $425,000 to $689,000. Amenities included a virtual doorman, fitness center and common roof deck. Sales launched last July, and 40 percent of the apartments received offers within the first month.